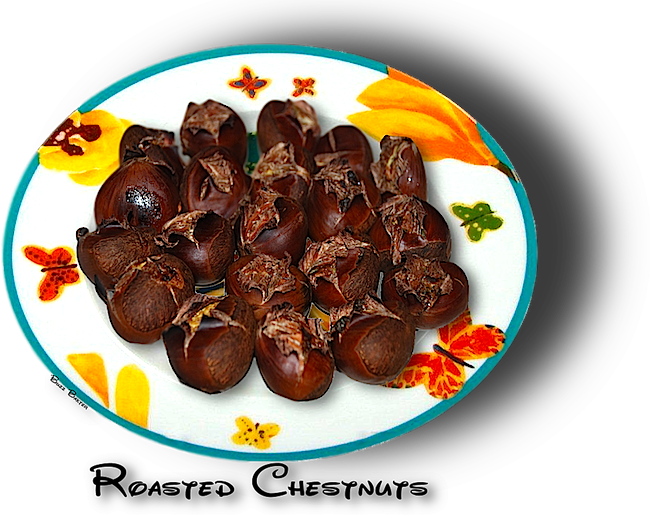 ROASTED CHESTNUTS - A STREET FOOD IN EUROPE - HOLIDAY TREAT IN THE U.S.A.
Roasted chestnuts used to be quite popular in the U.S.A. when I was a child growing up just after the depression. They are still a "Street Treat" in most of Europe, where traditions seems to hold a little more importance. When I was visiting there, almost every street corne rin the city had a roasted chestnut cart selling small paper sacks of the snack. "Roasting chestnuts o'er an open fire, Jack Frost nipping at your nose….". Lyrics from a Christmas carol that showed, that at one time the lowly chestnut held some importance in American life. At least during the Thanksgiving and Christmas holidays the grocery stores were filled with bins of fresh chestnuts. I would venture to say that a teenager today might not know what a chestnut was or has ever seen one. That is too bad, but tradition seems to be dying in the U.S.A. We are also losing a very tasty treat and some family oriented activity. 1. Make a large X in each chestnut with chestnut knife or a sharp paring knife, cutting through shell. 2. Toss chestnuts with oil in a bowl. covered, stirring every few minutes, for 15 minutes total. chestnuts are tender, about 5 minutes more. Serve hot. 1. When Roasting chestnuts, always start with fresh, blemish-free chestnuts. causing not only a safety hazard but a big mess to boot! 4. Using the tip of a sharp knife, carefully, cut a slit across the rounded side of your chestnut. 6. After slicing, arrange your chestnuts in a single layer on a shallow pan, such as a cookie sheet. away from the nut easily. Serve roasted chestnuts while still warm for best taste. 1. Be sure to peel away the outer shell and the inner brown skin before eating roasted chestnuts. who just can't stop once they get started. 2.To avoid stomach cramps, never eat raw chestnuts. 3.Remember to always store unused fresh, cooked, and/or roasted chestnuts in the refrigerator. NOTE: ALTHOUGH NOT THE EXACT RECIPE SHOWN,  THE VIDEOs BELOW MIGHT BE OF HELP.